Jacob Maker is a beekeeper who designs flight simulators. One day, the past arrives out of the future, and Jacob enters WAXWEB. 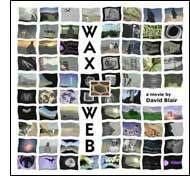 WAXWEB is a hypermedia version of the theatrically-distributed electronic feature "WAX or the Discovery of Television Among the Bees" (1991). It's available on the Web at http://www.waxweb.org, in English, French, or Japanese versions, or on CD-ROM with higher-resolution video in each language. Play the movie from beginning to end  an 85 minute theatrical feature. Or click the "hypervideo" at any time  the movie has 1200 shots, and every shot is recomposed inside 25 unique pages/spaces. Pictures: Meaningful and endless resemblence; start of a mechanical dream. Words: Hypertexts for each shot, sideways to time, and talking. 3d: Silent movies around each shot. The void of the dream. Stutter through the dream  then cut back to the movie. As you go, the movie moves into endless time, expanding to become a grotesque and miniature world.